On Friday, March 23, 2018 a French police officer heroically offered himself up in a swap for hostages after an armed Islamic militant, identifying himself as a “soldier of the Islamic State” and yelling “Allahu akbar,” went on a murderous rampage in France that left at last four people dead and 15 injured. 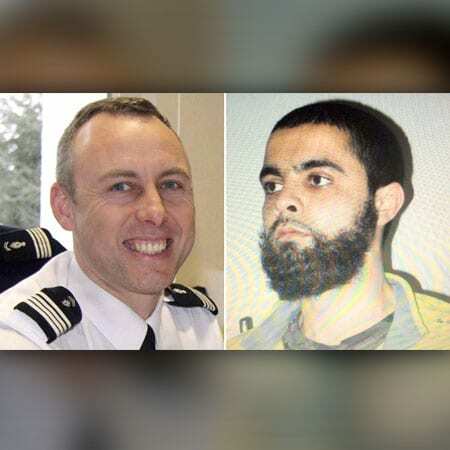 Lt. Col. Arnaud Beltrame, 44, died sacrificially as a hero in a response to the diabolical attack. The world is filled with heroes and cowards. Contrast Beltrame’s breathtaking heroism with the spineless cowardice of Islamacists and school shooters who massacre innocent and unarmed civilians to perpetuate godless agendas. Or note the incredible contrast between the cowardice of the Florida shooter, Nikolas Cruz, who murdered 17 innocent and unarmed people at Marjory Stoneman Douglas High School in Parkland, Florida, with 15-year-old Anthony Borges, whose classmates testified that he had used his body as a human shield to protect his fellow students and was shot five times. Note the heroism shown by the school’s assistant Football Coach, Aaron Feis, who died as a result of throwing himself in front of students to shield them from a hail of Cruz’s bullets. Earlier this month, the movie Tortured for Christ, was seen in theaters across the country, which is based on the sufferings of Pastor Richard Wurmbrand. I had the privilege of seeing Richard Wurmbrand give his testimony when I was a young Christian. He was unable to stand for long periods because the communists had repeatedly beaten his feet with a stick. In 1945, after the Soviet Union had occupied Romania with one million troops, they sought to consolidate allegiance of religious groups to the new atheistic state by holding a “Congress of Cults”. This assembly featured a live broadcast of speeches given by various “Christian” leaders, extolling the virtues of atheistic communism to the whole nation. Richard Wurmbrand and his wife Sabina, who were Jewish converts to Christ, were among the 4000 delegates in attendance. They sat horrified as they watched one professing Christian leader after another deny Christ by swearing allegiance to the murderous Communist regime. Sabina, heart broken over the blasphemous betrayal of so many professing Christian leaders, looked at her husband and said, “Will you not wipe the spit from the face of Christ?” Richard responded by saying, “If I do, you’ll lose your husband.” Sabina, replied, “I would rather be married to a dead man than to a coward.” Such convicting words by the pastor’s wife inspired Richard Wurmbrand to risk his life. He stood up and gave a stirring speech, declaring that the duty of Christians is to glorify the Lord Jesus Christ alone and not the state. His beloved wife, Sabina, was imprisoned a couple years later in 1950 and forced to undergo hard labor on the Danube Canal project. How often do we examine our hearts and resolve to refuse to be a coward and act heroically when the situation presents itself? As Christians, we would be wise to continually cry out to God to give us hearts to not just act heroically when duty calls, but to live heroically for Jesus every day. Each and every day presents its own challenges whereby we are called to live for the Lord and refuse to give into temptation or peer pressure. Each and every day we are setting a good or bad example for those around us, whether they be our children, spouses, friends or brothers and sisters in Christ. If we are unwilling to live heroically for Jesus every day, how will we be able to stand in the most evil day? I say we need to pray because it is not enough to say we will stand during times of crisis. Think of the apostle Peter, who resolved to refuse to deny Jesus, even exclaiming, “Lord, I am ready to go with you to prison and to death” (Luke 22:33). A short time later Peter denied the Lord three times. Peter had great intentions, but he relied on his own strength and placed his confidence in the flesh rather than the Lord. As a result he failed to heed Jesus’ warning, “Watch and pray so that you will not enter into temptation. For the spirit is willing, but the body is weak” (Matthew 26:41). “Then they will deliver you to tribulation, and will kill you, and you will be hated by all nations because of My name. At that time many will fall away and will betray one another and hate one another. Many false prophets will arise and will mislead many. Because lawlessness is increased, most people’s love will grow cold. But the one who endures to the end, he will be saved” (Matthew 24:9). “He who overcomes will inherit these things, and I will be his God and he will be My son. But for the cowardly and unbelieving and abominable and murderers and immoral persons and sorcerers and idolaters and all liars, their part will be in the lake that burns with fire and brimstone, which is the second death” (Revelation 21:7-8). “And they overcame him because of the blood of the Lamb and because of the word of their testimony, and they did not love their life even when faced with death” (Revelation 12:11). “When Rev. 21:8 places the fainthearted [cowardly] and the unbelieving in the lake of fire, it has in view Christians during times of persecution who, out of a fear of suffering, renounce their faith. It is a commonplace that human courage and cowardice are revealed in the face of death” (Ceslas Spicq, Theological Lexicon of the New Testament, Hendrickson 1994, I:301). “Do not fear what you are about to suffer. Behold, the devil is about to cast some of you into prison, so that you will be tested, and you will have tribulation for ten days. Be faithful until death, and I will give you the crown of life. He who has an ear, let him hear what the Spirit says to the churches. He who overcomes will not be hurt by the second death” (Revelation 2:10-11). “Then they left the presence of the council, rejoicing that they were counted worthy to suffer dishonor for the name. And every day, in the temple and from house to house, they did not cease teaching and preaching that the Christ is Jesus” (Acts 5:41-42). When we think of all that Jesus went through to save us from hell, and the heavenly kingdom He is preparing for us in His eternal kingdom, the temporary sufferings that we may have to face, it is a little thing by way of comparison. “You see, at just the right time, when we were still powerless, Christ died for the ungodly. Very rarely will anyone die for a righteous person, though for a good person someone might possibly dare to die. But God demonstrates his own love for us in this: While we were still sinners, Christ died for us” (Romans 5:6-8). May God give us such love and gratitude for Jesus’ sacrifice on our behalf, that suffering persecution for His name will be considered a great joy. May the Lord help us to understand that He will empower us, and has promised not to allow us to endure more than we are able to withstand (1 Corinthians 10:12-13). May He strengthen us to live and die as heroes of the faith and not die as cowards with the damned! Why Does Tom Brady Feel Empty and Nick Foles Full?